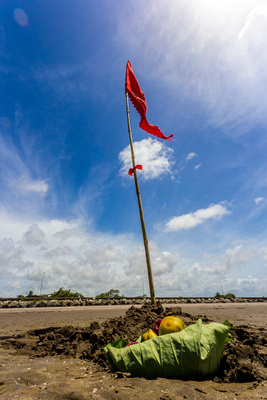 I was out by the seawall hoping to see a nice sky that I could use for a possible seascape when I came across a flag (Jhandi) planted on the beach with the leaf of the Lotus Flower plant at it’s base with the food offerings to Lord Hanuman. Click on the image to see it in the Seawall Gallery along with many other images from the Guyana Seawalls. Also click on the Lotus Flower link in the text above to see a brief post I once did on the plant. It’s thought provoking for me as a Christian a window on another’s faith. I wonder why I think of the Hawai’an tradition of leis flowers on the ocean, or the Chinese tradition of floating candles as more powerful symbols/offerings. Perhaps because I am not as familiar with East Indian traditions. The photo more culturally brings to mind flags we planted in beach sands as children propped up by a ring of stones on Northern beaches saying in the way of children unaffirmed: I AM HERE!